At the office of Dr. Shervin Aminpour, we regularly see patients suffering from many different symptoms in the ear, nose and throat. Many of these symptoms come from inflamed sinuses, which prevent mucus from draining properly. When this occurs, any number of symptoms can begin, such as sinus headaches, postnasal drip, nasal congestion and coughing. This condition of inflamed sinuses is called sinusitis, and it affects over 37 million Americans annually. Sinus surgery is a common method to treat sinusitis. As a highly effective sinusitis treatment, board-certified ENT Dr. Shervin Aminpour offers among the best balloon sinuplasty Los Angeles has available; a breakthrough, non-surgical procedure that delivers permanent relief from sinusitis. Balloon sinuplasty is an in-office procedure performed at Dr. Aminpour's private Los Angeles facility, providing patients relief from sinus pressure, chronic headaches, nasal headaches and postnasal drip. It's one of the greatest alternatives to sinus surgery Los Angeles provides. Prior to this procedure, patients would have to endure a full sinus surgery operation under general anesthesia, followed by at least a week of downtime. Now, with balloon sinuplasty, patients experience a procedure that lasts about 20 minutes. The downtime is only 24 hours. With only local anesthesia applied, patients are awake during the procedure and experience no pain and minimal discomfort. Further, they are able to watch the whole procedure on monitors. There is no surgical downtime, no bruising, no swelling, no scarring and no stitches, as there would be with a sinus surgery. Sinusitis, otherwise known as a sinus infection, is an inflammation of the tissue lining the sinuses. When this tissue becomes inflamed, mucus created in the sinuses doesn’t drain properly, creating blockage throughout the nasal passages. This creates a number of symptoms, including facial pain, nasal congestion, postnasal drainage, sinus headaches and more. During the balloon sinuplasty procedure, Dr. Aminpour inserts a catheter into the nasal cavity. This catheter provides Dr. Aminpour with a light and camera to ensure it’s placed in the correct spot. Once the location is confirmed to be accurate, a secondary catheter is inserted that contains a balloon that can be precisely controlled by Dr. Aminpour. Once the balloon is properly placed, Dr. Aminpour inflates it, causing it to clear the blocked nasal passage. The moment the balloon is inflated, the pressure within the sinuses is relieved, and the mucus is able to drain properly. 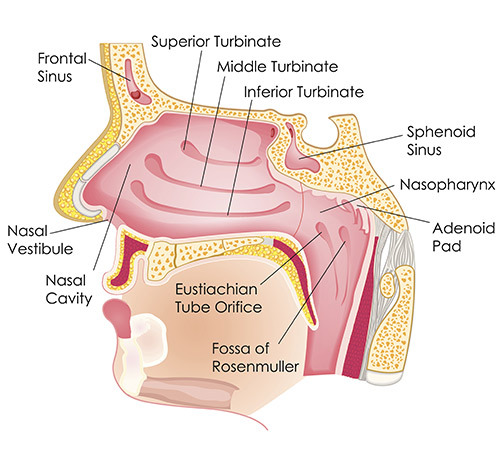 Once the sinuses have been opened up, most patients experience an immediate relief from their sinusitis symptoms. Headaches clear up, nasal congestion vanishes and pressure causing facial pain miraculously disappears. Further, because Los Angeles nose doctor Shervin Aminpour delivers balloon sinuplasty without general anesthesia, patients can go home just minutes after the procedure, unlike with sinus surgery. All in all, balloon sinuplasty may be the best thing to happen to patients suffering from sinusitis. By definition, sinusitis simply means inflammation of the nasal sinuses. This prevents mucus from draining properly, which results in a number of symptoms. An allergy, on the other hand, is an abnormal reaction to a substance that the body thinks is harmful, such as pollen. These two conditions are tricky to differentiate, because they often display very similar symptoms. However, they are very different conditions and may require different treatment. Understanding the difference between them is crucial to a long-term recovery. As one of the best ear, nose and throat doctors Los Angeles has available, Dr. Aminpour can provide relief from either condition. It should be known that balloon sinuplasty can treat both conditions. Regardless, it is important to receive a proper diagnosis so you know what you’re working with. If you have questions about your symptoms or would like to set an appointment, please give us a call. As one of the broadest health issues in America, sinusitis can prevent people from living a normal life. The symptoms can be debilitating, ranging from mild nasal congestion to sinus migraines, and everything in between. However, patients with sinusitis should know that help is available. Further, it is not in the form of comprehensive sinus surgery that requires a lengthy recovery period. It is in the form of balloon sinuplasty, which is a safe, effective and lasting procedure that directly addresses the effects of sinusitis. While balloon sinuplasty is a relatively new treatment, it has already been the subject of numerous clinical studies. These studies have shown that patients tested two years after treatment were still free from the symptoms of sinusitis. This shows that this groundbreaking procedure delivers results that are not only immediate, but lasting as well. If you suffer from sinusitis symptoms such as facial pain, sinus headaches, nasal congestion and postnasal drip, this procedure may just be the best thing to happen to you. Balloon sinuplasty is a revolutionary procedure that Dr. Aminpour regularly uses to treat his sinusitis patients. Because balloon sinuplasty is nonsurgical, it can be delivered right in the office with no need for an operating room or general anesthesia. It works by inserting a balloon catheter into the nasal cavity. This balloon is then inflated to open the nasal cavities back up following sinus inflammation. The results are immediate, and patients can walk out of the office just minutes after the procedure with a dramatic improvement in their symptoms. Recent clinical studies were conducted on patients who received balloon sinuplasty. After two years, these studies found that most patients were still free from the symptoms of sinusitis. If you are experiencing sinusitis symptoms, we recommend you find out more about this highly effective procedure. As a board-certified ENT, Dr. Shervin Aminpour strives to provide his patients with the best balloon sinuplasty Los Angeles offers. He does this by putting patient care as his first priority. During the entire procedure, he ensures total patient comfort while maximizing results. If you have questions about balloon sinuplasty or would like to come in for a consultation, please give us a call. If you are dealing with symptoms relating to sinusitis, we recommend you seek treatment sooner than later. These symptoms may be caused by sinusitis or another condition entirely. Either way, Dr. Aminpour is fluent in issues relating to the ear, nose and throat and can provide you with an accurate diagnosis. Whether the underlying condition is allergies or chronic sinusitis, a diagnosis can allow for effective treatment to begin. If you are looking for the best alternative to sinus surgery Los Angeles has available, Dr. Aminpour's balloon sinuplasty may be just the thing for you. At the office of Dr. Shervin Aminpour, we understand that patients can experience a number of symptoms relating to the ear, nose and throat. We also understand the confusion that can result, since patients may not know where the symptoms are coming from. We’ve prepared a short questionnaire for such patients so we can find out more information. From there, we can determine if balloon sinuplasty is the correct treatment. Take our online allergy and sinus health test to find out which treatment or procedure is right for your condition. It's fast and easy. Click below to get started.